In todays global, competitive economy, the importance of understanding operational risks and having an effective safety and risk management system has never been greater. ETI Inc. can assist in identifying, analyzing and controlling risks across your business value chain and minimize the risk of business interruption due to safety, health, and security issues. Amir Mousavi is the president and owner of ETI Inc. He has over 18 years of diverse experience in public safety management, leadership, safety, emergency management, and planning. Amir is a doctoral student completing his Ph.D. in Public Policy & Analysis with an area of concentration in Homeland Security and Emergency Management Policy Coordination. 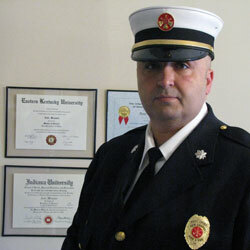 Mr. Mousavi is a firefighter/paramedic, and a Certified Emergency Manager. He is an instructor for a number of public safety agencies, speaker at a number of conferences, and adjunct faculty at Indiana University teaching classes in the field of Occupational Safety and Homeland Security/Emergency Management.